Delicious guacamole and excellent New England clam chowder. Our meals included soup or salad and we were rather surprised to find this on the menu! We ordered salmon stuffed crepes and shrimp. Both were delicious and the service was prompt and friendly. I stopped in at the Campos restaurant in Deming while in town doing some work. It's a little off the main road so you don't really see it unless you're looking for it. Found this place on the last day in town, and I'm so glad I did. Excellent food, great service, and a simple but very pleasant Mexican decor. The food is very reasonably priced and the menu is extensive. If you're in town definitely worth a stop, I will be coming back. We stopped and ate at this hidden gem a year ago. Stopped in again. As I had been eating Mexican food all day, I tried the green chile cheeseburger. Amazing. My husband had the enchiladas and loved them. Do not miss it. Tucked away off the main street 1/2 block. You will be glad you stopped. Took a chance on this mom & pop restaurant. So glad we did & recommend you do too!! True, authentic & delicious Mexican food. Try the albondiga soup!! Their salsas are also very tasty!! This restaurant may not look fancy on the outside but it is full of flavorful food. Also their kitchen & restrooms are VERY CLEAN. A definite plus!! If you are on the road and passing by Deming.. stop here. You won't regret it. This is one of the more over looked/overshadowed spots in Deming. The food is well prepared. They have a good selection of appetizers, al a cart, as well as full meal / big plate size entrées. Prices are more than fair for the portions. This is not a new flashy/snooty/trendy big city attitude "gastrowhatever". This is a very tried and true honest family run place, that will serve you stick to your ribs food and you will leave very happy. I have never had a bad meal there with family or friends over the years. Service is always great /with a smile and the chips & salsa (complimentary) are very good. Must haves: Albondigas Soup, Tacos al Pastor, Carne Asada, Tuesday Taco Night, German Chocolate Cake....you can't go wrong. 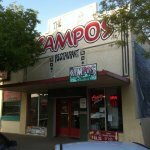 Been to Los Campos? Share your experiences!